Pacific oysters are now one of the most ‘globalised’ marine invertebrates. They dominate bivalve aquaculture production in many regions and wild populations are increasingly becoming established, with potential to displace native species and modify habitats and ecosystems. While some fishing communities may benefit from wild populations, there is now a tension between the continued production of Pacific oysters and risk to biodiversity, which is of particular concern within protected sites. The issue of the Pacific oyster therefore locates at the intersection between two policy areas: one concerning the conservation of protected habitats, the other relating to livelihoods and the socio-economics of coastal aquaculture and fishing communities. To help provide an informed basis for management decisions, we first summarise evidence for ecological impacts of wild Pacific oysters in representative coastal habitats. At local scales, it is clear that establishment of Pacific oysters can significantly alter diversity, community structure and ecosystem processes, with effects varying among habitats and locations and with the density of oysters. Less evidence is available to evaluate regional-scale impacts. A range of management measures have been applied to mitigate negative impacts of wild Pacific oysters and we develop recommendations which are consistent with the scientific evidence and believe compatible with multiple interests. We conclude that all stakeholders must engage in regional decision making to help minimise negative environmental impacts, and promote sustainable industry development. The online version of this article (doi: 10.1007/s10531-016-1209-4) contains supplementary material, which is available to authorized users. The proliferation of non-native species around the globe is considered one of the most important biosecurity concerns of our modern age (IUCN 2000). Although to date, and to the best of knowledge no marine taxon has become extinct as a result of the introduction of non-native species (Rilov 2009) many native species decline when they interact directly or indirectly with non-native species—some have declined considerably and there have been local (site specific) species extinctions as a result of competition (Byers 2009). Invasive species that have the greatest impact are often ‘ecosystem engineers’ that affect organisms via changes to the physical and chemical environment (Jones et al. 1994, 1997; Jones and Gutierrez 2007; Crooks 2009). These species may create, destroy or modify habitats (Crooks 2009; Sousa et al. 2009; Padilla 2010; Markert et al. 2010; Van der Zee et al. 2012). Pacific oysters (Crassostrea gigas) are now one of the most ‘globalised’ marine invertebrates and dominate bivalve production in many regions (Ruesink et al. 2005; FAO 2016a, b). The oysters have been introduced to 66 countries outside their native range, mainly for aquaculture, and there are now established self-sustaining populations in at least 17 countries (Ruesink et al. 2005; Smaal et al. 2006; Cardoso et al. 2007; Wrange et al. 2010). Although of considerable importance for coastal economies around the world, the introduction of C. gigas has also been very significant in maintaining the oyster fishing and cultivation culture and traditions of communities that have previously relied on native oysters, which in many regions are now declining (Goulletquer and Heral 1997; Zu Ermgassen et al. 2012; Humphreys et al. 2014). Crassostrea gigas is native in the NW Pacific and Sea of Japan and occurs primarily in warm temperate regions between latitudes 30°N–48°N. It is an estuarine species, generally attached to firm bottom substrates, rocks, debris and shells from the lower intertidal zone to depths of 40 m (FAO 2016a). In Europe and elsewhere, there has been confusion with the introduction of the Portuguese oyster C. angulata (Humphreys et al. 2014). Although they are currently considered separate species they may yet be shown to be conspecifics (Gofas 2013). Pacific oysters have a pelagic larval duration of 2–4 weeks, depending on temperature and nutrition (Rico-Villa et al. 2006; Syvret et al. 2008). The final larval stage will settle on the shore or seabed and develop a hard shell that in time will be recognisable as a juvenile oyster (Arakawa 1990; Reise 1998; Troost 2010). In this review, ‘wild settlement’ refers to the point when the oysters are first observed on the shore or subtidally either as juvenile or adult stages. Oysters become ‘established’ when reproduction is at a level sufficient to ensure continued survival. It is likely that a combination of factors enable wild establishment, including a lack of natural predators within receiving systems, beneficial traits such as rapid growth and rising air and sea temperatures as a result of global warming (see Troost 2010 for review). High temperatures appear to have caused an increased spawning frequency in parts of coastal Europe and wild settlement has occurred along much of the continental shoreline (Drinkwaard 1999; Reise et al. 2005; Troost 2010; Wrange et al. 2010; Lejart and Hily 2005, 2011; Herbert et al. 2012; Dolmer 2014). Oyster larvae are known to settle gregariously and to be attracted to conspecifics (Arakawa 1990; Tamburri and Zimmer 2007). Having initially settled on a shell or a small stone, clumps of oysters may merge to form dense aggregations and potentially a reef. A reef is formed when oyster densities are so high that little space may exist for subsequent oyster settlements or other species on the substrate surface. 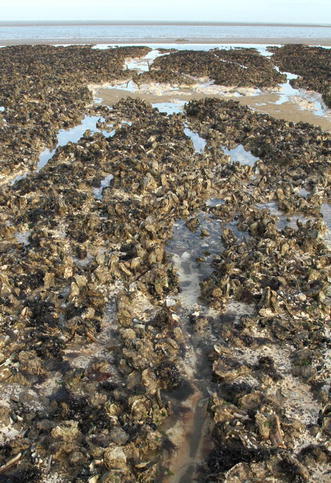 However, most Pacific oyster reefs in the Dutch and German Wadden Sea do not cover 100 % of the substrate and contain bare patches where soft-sediment communities are still present and shrimps and small fish may be found in shallow pools (Troost 2010). Reefs have generally been described in terms of the density of oysters per square metre, as opposed to the percentage coverage on the substratum surface. However where densities of live, mature oysters approach or exceed ~200 ind. m−2 there is generally little underlying natural substratum visible, especially as an amount of empty shell is also always present (personal observation). In some regions, significant areas of intertidal Pacific oyster ‘reef’ have developed with densities of 700 ind. m−2 (Wehrmann et al. 2006 cited in Markert et al. 2010) creating a hard substratum upon other habitats. Where the oysters have colonised mussel beds (Mytilus edulis) in the Wadden Sea, the density of live and dead oysters can be 2000 ind. m−2 (Markert et al. 2013). Subsequent settlements will often be on existing oysters, and over time a hard concretion of live and dead oysters develops (Walles et al. 2015), although the area, height and thickness of the reef often vary throughout a site. In the Oosterschelde estuary (Netherlands) wild settlement was first observed in 1975 and the first reefs were mapped in 1980 (Drinkwaard 1999; Smaal et al. 2009). However, in south-east England, although spawning had been observed intermittently over several decades during favourable summers (Spencer et al. 1994; Herbert et al. 2012), dense wild settlement and reefs first became noticed in the mid 2000s (Herbert et al. 2012). With naturalization of non-native aquaculture species, there is a dilemma between encouraging the beneficial services provided by extensive fisheries and aquaculture and the potential damage caused by their proliferation and potentially invasive traits (Goulletquer 2009; Humphreys 2010; Herbert et al. 2012; Humphreys et al. 2014). Although wild settlement can be beneficial for coastal fishing communities, in protected areas there is now a tension between the continued production of the Pacific oyster and risk to biodiversity associated with the growth of wild populations (Goulletquer 2009; Herbert et al. 2012; Humphreys et al. 2014). Many coastal species and habitats have been designated as protected areas under national and international conservation agreements e.g. European Habitats Directive (92/43/EEC) and Ramsar Sites. Conservation agencies and regulators are concerned that habitats and species of conservation interest are at risk from competition, displacement and proximity to non-indigenous species. If following assessment, sites protected under European law are deemed to be in poor (unfavourable) condition then the European Commission can initiate formal infringement proceedings that can result in financial sanctions for Member States if non-compliance is unresolved (European Commission 2016a). In parts of continental Europe and in temperate regions elsewhere, the proliferation of wild C. gigas is now regarded as an ‘invasion’ as C. gigas is spreading rapidly and is displacing native species and habitats (Diederich et al. 2005; Ruesink et al. 2005; Smaal et al. 2005; Cognie et al. 2006; Lejart and Hily 2005). Moreover the species is listed as ‘one of the worst 100 alien species in Europe’ (DAISIE 2016). There are also negative socio-economic impacts of wild settlement that range from potential injury to the public from ‘razor sharp oyster shells’, the maintenance of navigational channels for recreational craft, aesthetic issues (personal communications to authors) and trophic competition with commercial mussel farming (Wijsman et al. 2008). In the southwest Atlantic coast of France, wild populations of C. gigas were destroyed because they were competing with cultivated Pacific oysters and therefore limiting growth (Goulletquer 2009). The overall economic importance of C. gigas in many of these regions is extremely high (FAO 2016a, b). However in the UK and parts of Ireland, where the industry is yet to realise its full potential, the future of Pacific oyster aquaculture within designated protected sites is at risk due to conservation concerns about the potential impact of wild oysters (Herbert et al. 2012; Humphreys et al. 2014). The issue of the Pacific oyster therefore locates at the intersection between two policy areas: one concerning the conservation of protected habitats, the other relating to livelihoods and the socio-economics of coastal aquaculture and fishing communities. Other affected stakeholders include port authorities and recreational bodies. We aim to find sustainable solutions for the aquaculture industry, fisheries, conservation agencies and regulators. Our first objective is to review the evidence for negative impacts of wild Pacific oysters on selected, yet representative, broad-scale coastal habitats and species. Our second objective is to assess the risks and review potential management measures that have been trialled or suggested as a way of containing the impact of the oysters. This review considers evidence of potential direct impacts of wild settlement and establishment of non-native C. gigas on intertidal and subtidal habitats often found within protected areas. The exclusion of some habitats does not necessarily imply that the species will have no impact in them, although deep sea habitats are beyond the species range. We have not specifically considered the impact of C. gigas introductions on the spread and ecological and economic damage caused by the ‘hitch-hiking’ of other non-native species, parasites and pathogens. Neither have we considered in detail the direct environmental impact of cultivation of C. gigas. Although the focus is on European seas, information on ecological impacts was obtained from temperate regions around the world where C. gigas is cultivated and where habitats are broadly similar. The published literature was searched using the terms shown in Online Resource Appendix A. Information was obtained from areas with warm or cold temperate climate and within similar ‘Biogeographical Realms’ (Spalding et al. 2007). This was primarily undertaken through searching online research databases and catalogues (ISI Web of Science, JSTOR, ScienceDirect, Scopus, Google Scholar). To ensure that relevant ‘grey literature’ was incorporated, an internet search using the same search terms was conducted and professional networks and organisations likely to hold grey literature and information on unpublished and on-going studies were contacted via their websites and libraries (e.g. non-governmental conservation organisations, fisheries research institutes). Scientific experts with specific knowledge about the Pacific oyster and its ecology and habitat were contacted by phone and email and experts and stakeholders professionally engaged in aquaculture were consulted by email with a short questionnaire (UK only), by phone, face-to-face interviews or through visits to cultivation and production businesses. Many of these organisations and experts are listed within the Acknowledgements section of this review. The evidence collected in this way was used as the basis for a narrative review addressing the objectives stated above. Although studies of ecological impact encompass a range of broad-scale intertidal habitats, the number of replicated studies within some habitats and across different regions is relatively low (Table 1). Ecological impacts as a result of reef formation are almost entirely reported from Europe; in the Pacific North-west of the USA, reef formation appears not as extensive. Habitats that are causing most concern are intertidal rocky reefs (Fig. 1), muddy intertidal habitats (Fig. 2) and biogenic reefs, such as those formed by the honeycomb worm Sabellaria alveolata (Fig. 3). Studies on ecological impacts are generally local in scale and there has been little work so far on impacts on subtidal species as the extent of recruitment and colonisation of sublittoral habitats is currently unclear. A study on the micro-tidal coast of Sweden (Hollander et al. 2015) was technically sublittoral, however the species and communities investigated (M. edulis beds and soft-sediments) were comparable with those in the lower intertidal habitats of macro-tidal shores. Studies of impacts on seagrass have only been carried out in the Pacific North-west, whereas impacts on M. edulis beds have to date only been studied in Europe, which may reflect differences in the susceptibility of habitats to succumb to wild settlement in different temperate realms. It is uncertain to what extent C. gigas has had an influence on the decline of intertidal mussel beds. It is possible that C. gigas has colonized shell debris associated with former mussel beds and interfered with their re-colonisation through occupation of their former habitat, although there is no experimental evidence for this. Variability in mussel survival is likely to be related to regional levels of invertebrate predation (Nehls et al. 2006; K Reise pers.comm). Reduced fitness may also have facilitated the decline of mussels, as experiments have shown that mussels migrate downwards through the oyster reef to avoid crab predation, yet at the expense of reduced food supply and growth (Eschweiler and Christensen 2011). Yet, in some parts of the central Wadden Sea mussels are now increasing in the shelter of C. gigas reefs (Nehls et al. 2009; Markert et al. 2010). 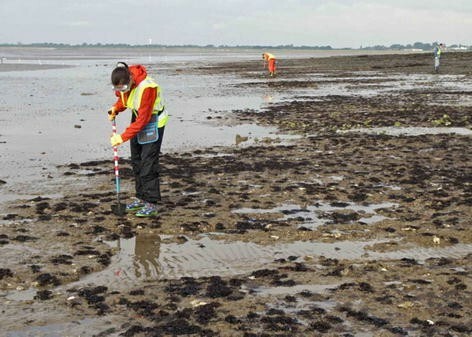 Small-scale experimental manipulations (0.25 m−2 plots) using transplanted oysters on mudflats at two different locations in Ireland showed that invertebrate species density and diversity increased between 5 % cover and 50 % cover of C. gigas, but then plateaued with no further increase at 100 % cover (Green and Crowe 2014). The responses of many species differed between locations and over time, suggesting that some effects are context-dependent. A study on mussel beds have found increases in macro-invertebrate diversity with high settlement of wild C. gigas (Markert et al. 2010), yet increasingly unsuitable habitat chemistry and anoxia associated with high rates of decomposition of biodeposits and microbial respiration is likely to be responsible for the suppression of species diversity at very high levels of C. gigas cover (Green et al. 2012; Green and Crowe 2013, 2014). Due to a sediment-free upper part of the reef and more turbulent current flow, species richness was significantly greater amongst the oyster beds compared to mussels and some faunal species were exclusively found on oyster beds, particularly anemones and suspension feeders (Markert et al. 2010). Higher species survival amongst the more complex oyster reef structure and bio-deposition of sediments was also thought to explain differences in species richness (Kochmann et al. 2008). Several studies on soft-sediment and rocky intertidal habitats have shown that species diversity can be greater amongst aggregations of wild Pacific oysters compared to the native habitat in which the oysters settle (Table 1). Although there appear to be significant negative impacts on some native species of conservation concern (e.g. Sabellaria reefs) to date there is no evidence for total displacement of any species in Europe. Although there may be beneficial effects of wild settlement on some coastal bird species (Cadée 2008a, b; Scheiffarth et al. 2007; Markert et al. 2013), there remains uncertainty on negative effects on others. The nature and scale of impact and engineering of Pacific oysters is dependent on the type of habitat that is colonised (Padilla 2010) and on the stage of invasion; a low density of scattered individual oysters may have little or no impact on biodiversity at regional scales. Yet at local-scales, the oysters can facilitate grazers (Ruesink 2007) and can modify the thermal regime of the habitat (Padilla 2010). Species interactions also influence community resistance to invasion. While there is evidence that a higher native diversity of sessile invertebrates can suppress a potential invader through competition for space (Olyarnik et al. 2009), this can be alleviated by facilitation, e.g. by the provision of space for secondary settlement on oyster shells. Crassostrea gigas reefs may compensate for the loss of ecological function of mussel beds in the Wadden Sea (Markert et al. 2010; Troost 2010). Yet comparatively little evidence is available for impacts of wild settlement of C. gigas on ecosystem functioning. In field experiments in Lough Swilly, Ireland, (Green et al. 2012; Green and Crowe 2013) C. gigas significantly altered several biogeochemical properties and processes, including fluxes of important limiting nutrients, and microbial assemblages and activity. Sediment–water fluxes of NH4+ and Si(OH)4 and benthic turnover rates increased with increasing cover of oysters in mudflats but decreased at the greatest cover of oysters in mussel-beds (Green and Crowe 2013). Community respiration (CO2 flux) increased with the greatest cover of oysters on mudflats and among mussels. At 100 % cover compared to 0 % cover, there was significantly greater total microbial activity, chlorophyll content and CO2 and CH4 emission from sediments (Green et al. 2012). At 10 % cover, C. gigas increased the concentration of total oxidised nitrogen and altered assemblages of ammonia oxidisers and methanogens. At any cover of C. gigas, concentrations of pore-water NH4+ were greater than in areas of mudflat without C. gigas. Thus C. gigas may alter ecosystem functioning not only directly, but also indirectly by affecting the microbial communities that underpin ecosystem processes. The water-filtering capacity of native suspension feeding benthic species is known to have a significant controlling effect on phytoplankton and nutrient levels in estuarine waters (Hily 1991). It is considered that the high filtration rate of C. gigas may also have potential to affect trophic dynamics within ecosystems by consuming high quantities of suspended particles and plankton (Ruesink et al. 2005; Troost et al. 2009; Troost 2010) that could also affect water quality. Cultivated C. gigas can reduce the carrying capacity and compete trophically with commercial mussel production (Wijsman et al. 2008). Modelled simulations of nutrients, oyster growth and phytoplankton in the Baie des Veys estuary in northern France showed significant depletion of phytoplankton above areas where C. gigas is cultivated, with consequences for the spatial distribution of plankton across the bay (Grangeré et al. 2010) and potential impacts on native suspension feeding species. Field investigations of the impact of extensive cultivated C. gigas on chlorophyll concentrations in Wallapa Bay, USA, supported modelled scenarios and showed that although oyster filtration rates were lower than laboratory measurements, the oysters can exert top-down control on phytoplankton production within estuaries (Wheat and Ruesink 2013). Yet isotopic analysis on the diet of wild Pacific oysters on rocky shores along an estuarine gradient in the Bay of Brest (Marchais et al. 2013) found that benthic biofilms and resuspended macro algal detritus, rather than phytoplankton, constituted the greatest proportion of the diet. The 1 m height difference between oysters cultivated on trestles and benthic wild oysters may explain variance in the proportion of benthic v pelagic sources (Marchais et al. 2013), so caution is necessary at extrapolating impacts of aquaculture to the issue of wild settlement. A higher near-bed turbulence caused by the roughness of Pacific oyster reefs, together with the high water filtration capacity of the oysters, may increase food intake rate (Troost et al. 2009; Troost 2010). Local coastal typology and hydrodynamics are also likely to be influential on water filtration. However, on a regional and landscape-scale it remains unclear what if any impact wild settlement of C. gigas will have on ecosystem function. It has been argued that, unlike other coastal developments and stressors, bivalve aquaculture on the Pacific coast of North America does not remove significant habitat area, result in a decline in water quality, nor is there any evidence for causing a shift to alternate states (Dumbauld et al. 2009). Wild settlement and reef formation of Pacific oysters may yet be considered beneficial in some contexts; providing supporting processes such as erosion control (Borsje et al. 2011) and ecosystem services in addition to food provision, such as the use of shells in construction and coastal defence (Piazza et al. 2005; Scyphers et al. 2011; Herbert et al. 2012). We have not specifically considered in detail the impact of C. gigas introductions on the spread and ecological and economic damage caused by the ‘hitch-hiking’ of other non-native species, parasites and pathogens. Potentially, C. gigas reef formation might facilitate their colonisation by creating a suitable habitat for their establishment. In the list of species colonising C. gigas reefs on rocky and muddy habitats in Brittany (Lejart and Hily 2011) there are only two non-native species that are not present in un-colonised habitat beyond the reefs; the barnacle Austrominius modestus (as Elminius modestus), that had colonised the shells of C. gigas on the muddy shore and the ascidian Steyla clava that had colonised the reefs but were not found in either natural habitat. However there are concerns that the invasive brush-clawed crab Hemigrapsus takanoi has that has recently been recorded in European C. gigas reefs (Wood et al. 2015) will prey on native Carcinus maenas (Dauvin et al. 2009; van den Brink et al. 2012). As C. maenas is an important prey species for some coastal bird species, these interactions would benefit from further investigation. There is a risk that the introduction of invasive non-native species might result in taxonomic homogenisation of the biota of habitats, as similarity of species composition increases following the combined effects of invasion and extinction of native species (McKinney and Lockwood 1999). Elton (1958) considered the business of culture and transportation of oysters, including C. gigas, around the globe was the greatest agency for the spread of non-native species, including oyster pests. This, he asserted, would result in faunas becoming similar across regions. It is possible that because C. gigas can colonise large areas of a wide variety of intertidal habitats, it will result in the biotic homogenisation of intertidal habitats at local and regional scales. In the Oosterschelde estuary (Netherlands), C. gigas reef has colonised the lower shore and currently represents approximately 8 % of the entire intertidal habitat (Smaal et al. 2009). Of the 115 taxa that were recorded within C. gigas reefs that had formed on rock and mud habitats in Brittany (Lejart and Hily 2011) only 11 were common to both reefs. However the reef that formed on the muddy habitat became dominated by carnivores at the expense of suspension feeders. In terms of the proportion of different trophic groups, this reef became comparable to the C. gigas reef that colonised the rocky habitat and the rock itself. These findings support those of Markert et al. (2010) who also observed the increasing dominance of carnivores (e.g. crab Carcinus maenas) on C. gigas reefs that had colonised mussel beds. Therefore although local taxonomic homogenisation might be currently considered low (~10 %), functional homogenisation (Olden 2006) may become greater. Large areas of mudflats in the Wadden Sea and rocky shore on the Atlantic coast of France have been transformed to non-native oyster reefs. The spatial dominance of large filter feeding organisms and higher filtration capacity of the oyster reef differs considerably to shores characterised by algae, grazers (e.g. limpets) and other filter feeders (e.g. barnacles) on a rocky reef. Dense wild settlement of C. gigas could therefore transform some protected habitats from a functional state in which they were originally designated, to a new functional state. Although the functional state of some rocky shores might be significantly transformed through the colonisation of C. gigas, the same may not necessarily be true for habitats consisting primarily of filter-feeders, such as mussel beds, as they may simply be replaced by an equivalent filter feeding species that can accommodate a similar associated fauna. On soft-sediment shores in the Wadden Sea, the distribution of C. gigas can overlap with native filter-feeding bivalve species such as Macoma balthica, Scrobicularia plana and Cerastoderma edule (Troost 2010). Yet although expansion of the oyster reef could be expected to have an impact on the diversity and abundance of native soft-sediment species on the lower shore, these species also occur above the tidal level of C. gigas reef development, although the extent of habitat overlap is likely to depend on locality. The spatial extent of the impact of wild settlement on the diversity and functionality of native habitats is therefore difficult to determine. While there is evidence of local impacts of wild C. gigas on species diversity and ecosystem functioning across a range of intertidal habitats there is less evidence of wild settlement on the ecological integrity of protected areas. Scaling-up impacts through spatial modelling may be beneficial; however it is also necessary to undertake field studies due to the context dependency of some impacts. Clearly the impact on sublittoral biodiversity also requires further investigation. Considering that the conservation of migratory birds is of great importance in Europe there has been relatively little investigation on the impact of Pacific oysters on behaviour and fitness. This is important as this could influence the type and scale of management interventions in areas affected by extensive wild settlement. Although species diversity of a non-native oyster reef might be greater than the native habitat and include higher densities of particular species (Lejart and Hily 2005, 2011; Markert et al. 2010), for areas protected under the EU Habitats Directive, it is the fundamental alteration in type and variety of habitats or biotopes that is important. The threshold level and area of impact whereby a site might be considered to have changed has not been quantitatively determined, and to our knowledge has not been legally tested or previously considered for a non-native species. However, as far as the EU Habitats Directive is concerned, of critical importance to whether a site is classified as being in favourable condition is whether the ‘integrity’ of the whole designated site is transformed. The integrity of the site has been defined as ‘the coherence of its ecological structure and function, across its whole area, that enables it to sustain the habitat, complex of habitats and/or the levels of populations of the species for which it was classified’ (European Commission 2000). Broad-scale changes and the transformation of species communities or biotopes might be interpreted as compromising the integrity of the designated site. In Britain, conservation agencies have concluded that even the loss of considerably less than 1 % of designated sites could be significant and in some cases would adversely affect site integrity (Hoskin and Tyldesley 2006), though not specifically for non-native species. The risk of ecological impacts of wild settlement in a warming world has unnerved conservation agencies and the aquaculture industry. For example, in the UK and Ireland, plans to develop a new Pacific oyster farm within or in the vicinity of a protected area may need to satisfy agencies and authorities that the proposal will not have an adverse effect on habitats and species. In Europe, there are various stages in the ‘Environmental (Appropriate) Assessment’ process; importantly however, the Likelihood of Significance of the Impact and the Impact on the Integrity of the Site will need to be determined. Examples of ‘Significant Impacts’ provided by the European Commission and UK agencies are shown in Table 2. Due to wide ranging impacts of non-native species, provisions are included in EU policies aimed at the protection of ecosystems and sustainable use of natural resources. However, species that have had a long history of aquaculture and which are of economic value are excluded from the scope of the EU Regulation on the prevention and management of the introduction and spread of invasive alien species (EU) No 1143/2014, as they can be listed within Annex IV of Council Regulation of the European Commission concerning use of alien and locally absent species in aquaculture (EC) No 708/2007 (EC-ASR). Article 4 of this Regulation confers a general obligation for Member States to implement measures to avoid adverse effects to biodiversity “which may be expected to arise from the introduction or translocation of aquatic organisms and non-target species in aquaculture and from the spreading of these species into the wild”. Yet under EC-ASR, EU Member States (European Commission 2016b) have discretion on whether to impose limits under Annex IV, for example if Pacific oysters have not previously been used in aquaculture. Invasive species are generally recognized as posing a risk to achieving good ecological status under the EU Water Framework Directive (WFD) and may preclude the area from attaining a high status water body designation. Similarly, invasive species are among the indicators to be used to assess environmental status under the EU Marine Strategy Framework Directive (MSFD 2008). Given these constraints, an authority may prohibit the transfer of oysters to an area in order to maintain or improve the status of a particular site. It should be noted, however, that the presence of Pacific oysters per se does not necessarily mean that action will be taken, as it is the impact of the species on the habitat and not the presence that is a concern. As the Pacific oyster is a non-native species in Europe it is subject to Article 22(b) of the Habitats Directive which requires Member States to “ensure that the deliberate introduction into the wild of any species which is not native to their territory is regulated so as not to prejudice natural habitats within their natural range or the wild native fauna and flora and, if they consider it necessary, prohibit such introduction”. However pathways for introduction of Pacific oysters other than aquaculture have also been implicated. Wild establishment as a direct result of introductions into marinas, harbours and ports from boat traffic as fouling or entrained larvae are as yet unproven but suspected. In the UK there are coastal regions where wild settlement is occurring that is distant from Pacific oyster production (Herbert et al. 2012; Smith et al. 2015). Moreover in Lough Foyle on the north coast of Ireland, wild oysters were shown to be genetically different from current stock obtained from local oyster farms (Kochman et al. 2012). While this may reflect changes in broodstock through time, it is also possible that there were other pathways of introduction (Kochman et al. 2012). Pacific oysters appear vulnerable to invertebrate predators (Syvret et al. 2008; Troost 2010), parasites (Troost 2010) cold winters (Buettger et al. 2011) and smothering by estuarine sediments (N. Miezkowska, pers. comm.). Mass mortality events across Europe caused by the ostreid herpesvirus 1 (OsHV-1) (Cotter et al. 2010; Segarra et al. 2010; Morrissey et al. 2015) may result in temporal and spatial fluctuations of wild settlement in some areas; moreover there is moderate confidence that outbreaks of some variants of the virus may increase with rising temperatures (Rowley et al. 2014). Yet the evidence suggests that frequent and dense settlement over extensive areas of certain habitats, if unmanaged, could put at risk the ecological integrity of protected sites. Within the existing European policy framework, widespread eradication and the prohibition of C. gigas aquaculture is highly unlikely as it would considerably reduce the economy of large areas of coastal Europe (Fig. 5). In some regions of France, wild spat has now become so economically important for the oyster industry (P Goulletquer, pers. comm.) that it is protected and carefully managed by fisheries administrations. Moreover the environmental sensitivity and impracticability of removing large areas of wild settlement has led some countries to adopt the species as naturalised (e.g. Netherlands, (Drinkwaard 1999). Yet under the EU Marine Strategy Framework Directive (MSFD 2008) member states are required to implement a surveillance programme and evaluate a programme of measures to reduce the impact of non-native species. Although C. gigas is listed as one of the worst 100 Alien species (DAISIE 2016) there appears to be no technical or political consensus on its environmental impact and management across Europe. Risk assessment protocols for the introduction of non-native species recommend a detailed analysis and review of possible ecological, genetic and disease impacts of the proposed introduction and the likelihood of spread within and beyond the release site (ICES 2005; Copp et al. 2016a, b). In the context of rising biomass and recruitment of Pacific oysters, these can include specific impacts on native species, such as competition for space with other species, modifications to trophic structure of habitats and sediment, impacts on protected sites and endangered habitats and economic considerations. In the UK, C. gigas is classified as presenting a ‘medium’ risk to nature conservation as the species could become invasive and have an impact on sensitive habitats and species (Sewell et al. 2010). In Scandinavia, separate risk assessments have been conducted for different habitats under IPCC climate scenarios (Dolmer et al. 2014). For example under both short-term and long-term climate scenarios, it was considered that Pacific oysters would have a ‘moderate’ ecological impact on littoral biogenic reefs in low energy areas (little or no tide, little current and low wave exposure) and a high ecological impact in high energy areas (large tidal fluctuations, strong currents and high wave exposure). Degrees of uncertainty associated with these impacts under different scenarios are also given. An application of the European Non-native species in aquaculture Risk Assessment scheme (ENSARS), a modular scoring scheme developed for evaluating the risk of introduction, establishment, dispersal and impact of species under EC-ASR, rated Pacific oyster as having an overall ‘medium’ risk (Copp et al. 2016a, b). This was carried out by two French assessors with metropolitan France as the risk assessment area, for which the confidence level of assessment for ‘introduction’ and ‘impact’ was rated as ‘high’. In circumstances where the eradication of species that are potentially damaging to ecosystems and the economy is not possible then management measures, that are proportionate to the impact on the environment, should be proposed (European Union 2014). 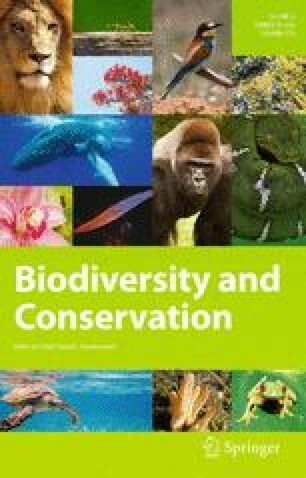 The development of management measures to control the spread of invasive species in open marine ecosystems present unique technical, social, economic and political challenges.Yet there has been progress in the development of decision-making frameworks and protocols that help to assess the risk of control programmes and the effectiveness of different options (Bax et al. 2001; Thresher and Kuris 2004). These can range from physical removal of the pest species to commercial utilization, the application of biocides and biological control agents, genetic approaches and efforts to rehabilitate and improve the biological resistance of the environment (Thresher and Kuris 2004). The level of ecological and socio-economic risk of wild settlement and impact may not have reached its maximum in all regions. However, there is some inevitability that, should predictions of continued warming under the IPCC scenarios be realised, the frequency and magnitude of settlement will increase, causing existing populations to rise and new populations to become established. As the level of environmental and ecological risk varies with locality then a local or regional approach to the management of wild Pacific oyster settlement is likely to be more effective than broad-scale measures that in some areas may currently be irrelevant. Figure 5 summarises the decision making process that supports this assertion and provides examples of management options that could be selected in a specific regional context. Here we review various approaches to reduce the risk of wild settlement of C. gigas in protected areas and negative impacts of its establishment. The rate and extent to which C. gigas might become established will depend on the ‘invasion (or propagule) pressure’ and the biological resistance of the receiving system (Williamson 1996; Rilov and Crooks 2009). Invasion pressure and larval supply will be determined by the frequency of introduction, the size and fecundity of introduced breeding stock and the physical characteristics of the water body, including hydrodynamics that will determine larval transport. It is generally accepted that wild settlement is dependent on the attainment of critical water temperature thresholds for oyster gametogenesis, spawning and larval development (Miossec et al. 2009; Dutertre et al. 2010). In Europe, the frequency at which temperature thresholds are now reached has increased within the past two decades (Dutertre et al. 2010). The use of ‘degree days’ (the annual number of days when temperatures meet thresholds for conditioning (gametogenesis), spawning1 and recruitment2), for assessing ‘wild settlement risk’ is considered a useful initial screening tool when planning for, or re-licensing C. gigas aquaculture developments (Syvret et al. 2008). Yet there is uncertainty with respect to acclimatisation to local temperatures, physiological adaptation and duration of the larval development phase in response to available nutrition. Notwithstanding site anomalies and the requirement for accurate temperature measurements, this risk-based management has been incorporated into a ‘Pacific Oyster Protocol’ that has become acceptable to some in the UK industry and regulators (Syvret et al. 2008; Woolmer 2009). Through spatial planning, it could be possible to manage the scale of aquaculture operations and introduce husbandry restrictions within each water body to minimise larval production, survival and shore settlement. Water bodies at particular risk could be identified using models of environmental characteristics associated with C. gigas establishment (Kochmann et al. 2013) and hydrodynamic models (Brandt et al. 2008; North et al. 2008) that could be adapted to investigate larval transport and dispersal. Assessment of the physical characteristics, flushing characteristics, water residence time and temperature regime of associated water bodies could enable the identification of water bodies that, due to their physical characteristics, might be particularly vulnerable to wild settlement should cultivated (reproductively active) biomass exceed a particular threshold. In this way, restrictions on aquaculture could be appropriately targeted rather than widely applied. Pacific oysters are cultivated in a variety of ways depending on exposure, substratum and degree of siltation (Miossec et al. 2009). Studies on the impact of oyster husbandry have focussed on variation in growth and mortality, rather than reproductive condition and development. In a review of research on the French Atlantic coast (Goulletquer et al. 1998) and south-west England (Robbins 2005), Syvret et al. (2008) concluded that ‘parc’ or on-bottom culture might result in a greater level of reproductive potential compared to off-bottom cultivation in bags on trestles, though the type of cultivation that is appropriate and employed will be dependent on local factors related to the degree of shelter and hydrodynamics. Studies in North Wales have shown that growth rate can be greater at lower tidal levels (Spencer et al. 1978) and there is evidence from the Atlantic coast of France that reproductive condition (gonadosomatic index) increases with immersion time and in animals greater than 2 years old (Goulletquer et al. 1987). This would suggest that high shore cultivation would result in reduced spawning potential. However contradictory findings were obtained in North Wales by King et al. (2006) who found gonad development to be greater at high shore compared to low shore sites, though oysters showed little maturation and spawning. Experiments in British Columbia on the growth rate and mortality of oysters suspended at different depths within the water column (Cassis et al. 2011) showed that these parameters were affected by depth, temperature, freshwater input, phytoplankton abundance and assemblage composition. On the west coast of Ireland differences in the condition of intertidal and subtidal oysters varied between sites and among months (R. Mag Aoidh, unpubl.data). Experimental studies (Chavez-Villalba et al. 2003) showed that C. gigas had flexible reproductive patterns depending on food variability. Clearly the issue of reproductive condition and likelihood of spawning is complex and influenced by several site specific factors and temporal variability. Aggressive and invasive outbreaks of wild settlement can only be effectively managed if good quality data is available and forthcoming. Frequent surveys are important and necessary to assess the distribution and density of wild settlement. In New South Wales (Australia), up to date distribution data has been used to inform Risk-based Pacific Oyster Regulation and movement controls between estuaries have been implemented to minimise the spread of the species in the wild (NSWDPI 2015). As a requirement for licensing in Wales, oyster growers have been asked to remove any signs of wild settlement (Herbert et al. 2012). One of the only feasible modes of containment for non-native species within the aquaculture industry is reproductive sterility (Allen and Guo 1996). A method of achieving sterility is induced triploidy, a condition in which a cell or organism has three sets of chromosomes as opposed to the normal two sets of chromosomes. The triploid condition can confer a level of sterility through rendering the oysters unable to produce viable gametes and hence preventing spawning and wild settlement. The likelihood of triploid oysters producing viable offspring has been reported to be extremely low (Guo and Allen 1994) and, by all practical measures, zero (Allen and Guo 1996). Although considered by the authors as an over-estimate Suquet et al. (2016) has calculated that the reproductive potential of triploid Pacific oysters is close to 0.06 % that of diploid individuals. A further issue relates to the stability of the triploid condition. In the USA, a trial in which ‘certified triploid’ oysters were placed in the York River was halted when it was discovered that about 20 % of the oysters had a ‘dual cell state’, containing both diploid and triploid cells (referred to as ‘mosaics’) (Gottlieb and Schweighofer 1996; Allen and Guo 1996; Allen et al. 1999). Investigating the chromosomal stability of triploid populations in the USA, Allen et al. (1999) reported that over a period of 2 years, there was a progressive reversion with more diploid cells accumulating over time. The frequency of reversion in chemically induced triploids had been two to three times higher than in mated triploids and the frequency of reversion also varied between grow-out sites, with harsher environments potentially exacerbating the problem of reversion (Allen et al. 1999). Jouaux et al. (2010) showed that in about 25 % of mated triploids, the process of gamete production closely resembled that of diploid oysters. Triploid oysters cannot be considered to be ‘non-reproductive’ (Normand et al. 2009) and there is evidence that gonad development and spawning in triploid C. gigas may be enhanced in unusually hot summers (Normand et al. 2008) which are predicted in current climate change scenarios (IPCC 2014). There is no doubt that there is still a measure of uncertainty concerning the circumstances and risk of reversion, however given the lower reproductive potential of triploid Pacific oysters, they should be considered as a potential measure for biological containment. The relative reproductive potential of triploids is increased when they are crossed with diploids (Gong et al. 2004), so their introduction into regions where there is wild diploid stock is unlikely to be effective at containing outbreaks. However in regions where diploid stocks are zero or very low, there may be merit in using triploid oysters as a practical measure to reduce the probability of wild settlement. It has been shown that there is no significant difference in growth when the growing conditions of the area are poor (Nell 2002). Yet in the UK, some growers are concerned about high growth rates of triploids and the cost of seed (Herbert et al. 2012), so broad acceptance within the industry might be difficult to achieve (Herbert et al. 2012). Nevertheless, triploid C. gigas are used widely in Australia (O’Connor and Dove 2009), France (Normand et al. 2008), the USA and Ireland and this approach may become important for the containment of oysters in culture (Guo et al. 2009). Total eradication is not feasible or practical as densities are now so high in some regions that sufficient brood stock is likely to remain and settlement will continue. After extensive establishment of Pacific oysters in the Wadden Sea, there was unanimous agreement that any large scale eradication or control methods would harm other components of the native ecosystem (Reise et al. 2005). 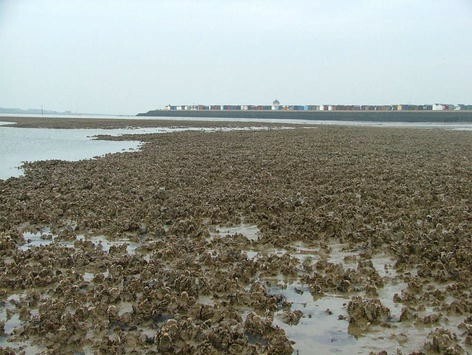 In the Oosterschelde estuary, Netherlands, where wild C. gigas can reduce the carrying capacity and compete trophically with commercial mussel production, an experimental dredging of 50 ha of intertidal wild oysters and sub-littoral cultivated beds was carried out using mussel dredges (Wijsman et al. 2008). The oysters could be effectively removed and the operation involved 940 boat hours (20 boat hours per ha). At one of the dredging sites there was little impact on subsequent oyster settlement and, at a second site, some hard shell debris remained on the mud surface. Oysters subsequently settled on the cleared areas, though there was no monitoring plan and it was concluded that beds should be cleared every 5–7 years to reduce potential competition between oysters and other harvestable shellfish species (Wijsman et al. 2008). Yet most reefs have remained undisturbed (i.e. unfished) since their first mapped appearance in the 1980s (Smaal et al. 2009; Walles et al. 2015). The general consensus of experts in the Wadden Sea is that large-scale dredging would cause considerable habitat damage (Reise et al. 2005; K. Reise pers. comm.). Since the 1990s, spatfalls of C. gigas have increased on the west coast of France and industrial equipment has been used to clear wild beds of C. gigas and colonised infrastructure that were competing with cultivated beds (Goulletquer 2009). In shallow (<2 m) areas of Lake Grevelingen (a saltwater lake in Holland) where the sharp shells of wild Pacific oysters have injured swimmers, the oysters are removed by grabs, and the remaining shells are covered by sand (Wijsman pers. comm.). The effectiveness of removal of wild C. gigas (mean density <1 m−2) has been investigated in Strangford Lough, Northern Ireland (Guy and Roberts 2010). Shells encountered on transects were broken with a hammer during the spring. In the year following the cull, although densities at un-culled sites continued to rise, oyster density at culled sites had dropped by nearly 100 %. It is assumed that oysters that were hammered were killed and that there had been no further settlement at these sites. It was concluded that the measure could be beneficial at reducing population expansion in the early stages of invasion. The probability of settlement may be reduced further if shell debris is also removed as this can be attractive to settling larvae (Arakawa 1990; Gutiérrez et al. 2003). 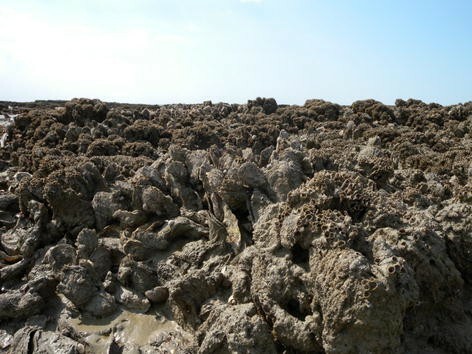 Rocky habitats may present the greatest challenge in terms of management and containment due to difficulties associated with the physical removal of oysters. A pilot trial to hold the advancing line of Pacific oysters has been conducted in Kent, south east England (McKnight and Chudleigh 2015). The objective was to reduce the wild spawning stock that had colonised chalk intertidal platforms and artificial structures and prevent settlement on nearby protected chalk reefs and intertidal mudflats. Using a variety of tools including edging spades, rods, hammer, pliers and safety equipment, over 40,000 oysters were removed during 43 site visits (96 man hours) along three sections of the coast where they had colonised chalk reefs and mussel beds. However it remains to be seen if the rate of wild settlement in this region is reduced. It is anticipated that further work will be undertaken by a volunteer group in the locality (Fig. 4). Between 1976 and 1981, handpicking was used to reduce the wild stock of Pacific oysters in the Oosterschelde. These attempts failed and the new inhabitant was accepted as belonging to the Dutch fauna (Drinkwaard 1999). Yet recently, local stakeholders have financed a pilot scheme to remove Pacific oysters from selected beaches where their sharp shells cause injury to tourists (P. van Avesaath pers comm). An efficiency study has shown potential for economic exploitation of isolated oysters and profits appear high enough to support future interventions which are being planned in the southern Dutch Delta (P. van Avesaath pers comm). Guided walks to the oyster reefs are also being organised for visitors to collect wild oysters for food (BBC 2015). Depending on a favourable market, it is possible that some effective control on wild Pacific oyster settlement could be possible through regulated fishing and hand-collecting. Both hand-collecting and dredging over soft sediment habitats creates patches of open mud within oyster reefs for bird feeding. Moreover, the density and spatial arrangement of Pacific oysters has been shown to affect the impact of wild settlement upon the native Australasian oyster Saccostrea glomerata (Wilkie et al. 2013). Although fishing activity creates different impacts and disturbances on intertidal benthic species and habitats (Hall and Harding 1997; Spencer et al. 1998; Kaiser et al. 2001; Piersma et al. 2001) and hand-collecting may disturb bird feeding at low tide (Goss-Custard et al. 2006), it is possible that the extent and intensity of these activities could be managed by acquiring licences. In the Blackwater estuary on the south-east coast of England, large areas of C. gigas ‘reef’ have been hand-picked ‘clean’ of wild oysters to create areas for re-laying oyster seed (Herbert et al. 2012). This seed does not grow to maturity to form reef but is either hand-collected or dredged and re-laid in creeks for on-growing. A variety of wading birds can feed in areas where oysters have been removed and amongst newly laid seed. Notwithstanding marketing and biosecurity challenges (Humphreys et al. 2014; Schrobback et al. 2014; Ronholm et al. 2016) there is an increasing demand for aquaculture and oyster products (FAO 2016b). As in the Oosterschelde it may be possible to provide financial incentives to support and develop a sustainable industry, particularly where dense reefs have not yet formed, as individual oysters have far greater value than those with distorted shells. For example in ports, harbours and marinas, where fouled vessel traffic is suspected of contributing to wild settlement (Herbert et al. 2012; Smith et al. 2015), harvesting oysters may be a viable way of controlling the stock. Business start-up schemes and fisheries and aquaculture support schemes could be appropriate avenues for support (Fig. 5). Global climate change presents new challenges and risks with respect to the management and conservation of the marine environment (Hawkins 2012). The biosecurity of marine resources, including all cultivated species, must be given a high priority in view of predicted rises in air and sea temperatures and the increased risk of economic and environmental damage caused by invasions of non-native species. Few could have predicted the enhanced fecundity and growth of wild populations of Pacific oysters in Europe as result of higher temperatures, and the potential and actual environmental impacts. We conclude that in view of the potential risks to biodiversity, all stakeholders, including growers, port and harbour authorities and statutory environmental agencies must engage in regional decision making (Bax et al. 2001) to help minimise any negative environmental impacts of wild settlement on features of conservation interest, while at the same time, and within those constraints, maximising opportunities for sustainable industry development. Without stakeholder co-operation and managed interventions, the ecological impacts of wild settlement on species and habitats are likely to be exacerbated (Herbert et al. 2012). To maintain habitats in good condition and protect features of conservation interest it is important to develop strong partnerships between agencies and fisheries; in the Blackwater estuary, fishing interests, nature conservation organisations and the harbour authority are attempting to ensure aggressive outbreaks of wild settlement on mudflats are controlled through localised dredging (Herbert et al. 2012). However the success and continuity of these partnerships requires a vibrant industry, therefore incentives and assistance with marketing of produce might be required to achieve both commercial and conservation objectives. It is possible that natural disturbances combined with managed interventions, including some fisheries, could maintain site integrity and functionality in some designated areas. With much uncertainty concerning the impacts on biodiversity features resulting from new aquaculture developments, an ‘adaptive management’ approach has been applied using trials and essentially ‘learning by doing’ (Woolmer 2009; Online Resource Appendix B). In terms of specific measures, consideration should be given to establishing regional management plans governing the size of aquaculture operations and number of regional licences. This needs to take account of physical and hydrographic characteristics of water bodies present in the region (Kochmann et al. 2013). In certain circumstances it might be appropriate that a strategy for risk mitigation, such as contributions to the removal of any wild settlement that occurs, could be negotiated as part of the biosecurity aspect of the licensing process. Although there are uncertainties concerning the stability of their sterile condition and effectiveness, in areas where wild settlement is currently absent or where stocks are very low, the use of triploid Pacific oysters within aquaculture should be considered. The spatial extent of any removal of wild settlement would need to be agreed between growers and agencies but a focus on particularly sensitive habitats, such as Sabellaria reefs, might be prioritized. In addition, efforts to increase populations of vulnerable or scarce species, such as the restoration of native oyster (Ostrea edulis) in the Blackwater estuary (Herbert et al. 2012), could also be encouraged. The economic feasibility of different management options needs to the assessed and capacity building is required in many of these areas to deliver these approaches. 600° days for conditioning and spawning (>18 °C assumed trigger for spawning). 825° days required to achieve larval metamorphosis. Much of the research was conducted for the Shellfish Association of Great Britain (SAGB) with funding from the European Commission and British Government (Defra). We are particularly grateful to SAGB, Defra, The Marine Management Organisation and Seafish among others for their contributions on the project steering committee. We are also grateful to may acknowledged experts on Pacific oysters including Karsten Reise, Alfred Wagner Institute for Polar and Marine Research, Germany; Jennifer Ruseink, University of Washington, Seattle, USA; John King, University of Wales (Bangor); Nicolas Desroy IFREMER, France; Ximing Guo, Rutgers University, USA; Ian Laing, Mike Gubbins and Rachel Hartnell, Centre for Environment, Fisheries and Aquaculture Science, UK; Martin Syvret, Aquafish Solutions Ltd, UK; John Bayes, Seasalter Shellfish (Whitstable) Ltd, UK; Gary Wordsworth, Othniel Oysters, UK; Richard Haward and Mersea oystermen. We are also grateful to the reviewers of this manuscript for their helpful and constructive comments. Errors remain the exclusive responsibility of the authors. The review is based on a report commissioned by the Shellfish Association of Great Britain.